I copied the HTTPS URL into the browser, downloaded the SSL certificates & Installed them in the browser using Internet Explorer. Used the keytool's import option. The command below executed without any errors. I was prompted for a password at the command prompt, which I entered then I was authenticated. This could happen if you are not running the command prompt in administrator mode. If you are using windows 7, you can go to run, type cmd and hit Ctrl+Shift+enter. This will open the command prompt in administrator mode. If not, you can also go to start -> all programs -> accessories -> right click command prompt and click 'run as administrator'. I had the same problem under Windows and could solve it by running cmd.exe as administrator (right-click in start menu, then "Run as administrator). Check the write permissions on the keystore. I was having the same problem while importing the certificate in local keystore. Whenever i issue the keytool command i got the following error. Following solution work for me. 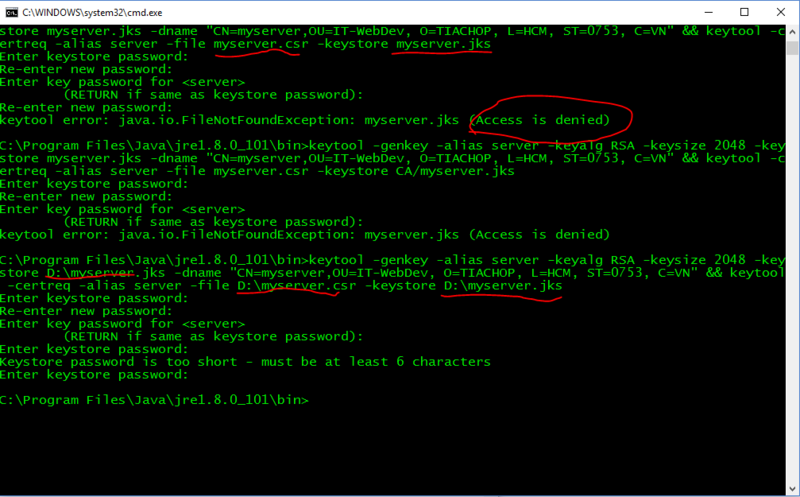 5) you will see the following message on successful "Certificate was added to keystore"
Make sure you are giving the "cacerts" only in -keystore param value , as i was giving the full path like "C**:\Program Files\Java\jdk1.8.0_151\jre\lib\security**". For Mac users make sure to sudo and when prompted first give your administrator password and that will be followed by keystore password which typically should be "changeit" unless you actually changed it. From the result, right-click command prompt and click Run as administrator. Then execute the keytool command. I even run the command prompt as Administrator but it didn't work for me with the below error. I have the same issue on Windows 10 when using PowerShell, but works if I'm using cmd. You can give yourself permissions to fix this problem. Right click on cacerts > choose properties > select Securit tab > Allow all permissions to all the Group and user names. Just run CMD as an administrator. Not the answer you're looking for? Browse other questions tagged java ssl ssl-certificate keytool or ask your own question. How can I get write access to the JRE? How to delete already import certificate/alias by keytool command?